China is investigating a spam attack after almost half of China's mobile phone users received unwanted text messages from advertisers. 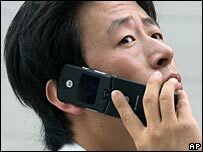 Text messages were sent to more than 200 million mobile phone users through China Mobile and its smaller rival China Unicom. China's authorities said the spammers must "correct their wrongdoing". China Mobile earlier apologised for loopholes that allowed the spread of spam text messages. It has vowed to block text messages originating from seven online advertising firms, the state-run Xinhua news agency reported. "We urge parties concerned to beef up self-scrutiny to correct their wrongdoing, which is profit driven in defiance of public interests," said deputy head of the State Council Office for Rectifying Malpractice, Liu Yue. The latest attack on mobile phone spam came to light after an investigation by state-run China Central Television, timed for World Consumer Rights Day on March 15. Both mobile phone firms have set up hotlines to handle consumer complaints.